I was a little MIA at the end of last week... sorry! Our family traveled to Kansas to visit relatives, and we are only back home for a few days before we head to Arizona to see friends (and enjoy the nice weather!). So I've been busy packing and cleaning and haven't had time for much else. Why is it that you always feel the need to leave your house clean? Or is that just me? I guess it is nice to come back to a clean house. Anyways... I am just writing a quick post to remind you that today is the last day to get the exclusive Sale-a-bration items with your $50 order. I am so tempted to place one last order... but I think I've already spent my fair share this time! There are so many great things in the Sale-a-bration catalog this year. The Sweet Sorbet DSP is probably my favorite, followed closely by the Petal Parade stamp set. Click here to do some last-minute shopping and get your favorites! 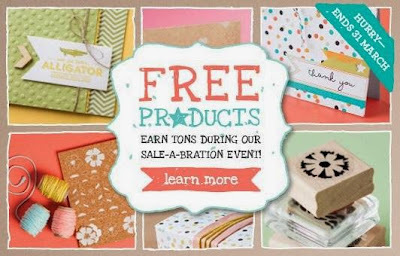 As a special bonus, if you place your last-minute Sale-a-bration order with me, I will send you the projects from my May Stamp Camp for free! Or, attend the Stamp Camp for free if you are local. What a great deal! I'll be back tomorrow with the Weekly Deals, and I hope to squeeze in at least one card sample later this week. I also love this card because it uses Banner Blast, one of my favorite items in the Sale-a-bration catalog. I think I will get a lot of use out of that stamp set! If you love it too, remember that there's only one short week left to get your orders in. Click here to shop in my store and earn it for FREE with your $50 order! Embossing Buddy Tip ~ Use It! So if you've been wondering if the Embossing Buddy is worth it, it is! And it doesn't even cost that much. Click here to get one for yourself! 1) Order the All Wrapped Up Bundle from my online store. 2) Choose Sweet Sorbet DSP as your free Sale-a-bration item. 3) Pick a time from those listed above and click on the You Tube link to join the fun! 4) Create some great projects from the comfort of your own home! I can't wait to see what projects will be featured at this event! I hope you'll join me for some stamping fun! Don't forget ~ order your bundle now so that it will arrive in time for the big event. I've said it before, and I'll say it again: kits are awesome! They are affordable, easy, and you end up with some beautiful handmade cards. And now I have a new reason to love them! Here is the thank you card I created. Everything except for the Island Indigo Baker's Twine came from the Everyday Occasions kit. Enjoy! Rich Razzleberry ~ One of My Favorites! If you ask most people what their favorite color is, they will probably respond with blue, or red, or purple. But if you ask me, I might just tell you that Rich Razzleberry is one of my favorites! This card uses Rich Razzleberry and Whisper White, and that's it! If your favorite color happens to be Bermuda Bay or Strawberry Slush (more favorites! ), just switch the colors and you'll still have a gorgeous card. Would you believe this is another nephew's birthday card? That's right, 4 out of 8 nephews have birthdays this month. Two of them will be getting this cute little card in the mail. What little boy doesn't love a fire truck? This card uses the stmap set You're My Hero. I looked around the web for some inspiration, but didn't find a lot, so I ended up making this up on my own. This card is proof that anyone can stamp, even if you don't have a lot of time. I colored the fire truck with my blender pens while my one-year-old was literally climbing all over me. Sometimes you gotta do what you gotta do to get a few minutes of crafting! I'm a little late in posting the deals this week, but better late than never! There are a lot of great Big Shot items this week! Click here to shop for these deals in my online store. I used the Tag It stamp set for this card, along with the Chalk Talk framelits and a colorful array of markers. I just splurged on the entire set of markers, and I love having so many colors available at my fingertips! Tip: The markers work great for coloring stamps if you want to use multiple colors. After you finish coloring the stamp, just give it a quick breath of air (I call it huffing) to make sure the ink is all wet, and then stamp the image on your cardstock. I thought I would take some time today to talk about a different kind of product that is offered by Stampin' Up! The product I'm referring to is called Paper Pumpkin. What is it? Paper Pumpkin is a monthly kit that is sent straight to you. It includes everything needed to make cards or a project, and you can choose to either make the suggested project or create something of your own with the supplies in the kit. Paper Pumpkin is $19.95 a month. You can cancel at anytime, or just skip a month if you want to. Now is a GREAT time to try it out! Why? Because if you subscribe by March 31, you will get a set of 2012-2014 In Color Markers for FREE!!! * The markers are a $14.95 value, so even if you decide that Paper Pumpkin is not for you, you've still gotten a great deal! If you want to find out more, or sign up, visit https://mypaperpumpkin.com?demoid=2113176. If you decide to sign up by March 31, please let me know, and I will send you a special thank you gift as well. This deal is so great, I'm thinking about getting in on it myself! Today's card is another one from my Stamp Camp this past weekend. It uses the Peaceful Petals stamp set again, as well as paper frpm the Fresh Prints Paper Stack. I'd say it's one of my favorite patterns in the stack, but I've had a hard time picking favorites - they're all great! I stamped the flower in Sahara Sand on a piece of scrap paper, then stamped it again on my cardstock without re-inking. That makes the image a little lighter, serving as the perfect backdrop for the greeting. I attached my ribbon with sticky strip. I've tried using other adhesives, but in my opinion, the sticky strip is the best for ribbon. The card is a normal size, 8 1/2" by 5 1/2", scored at 4 1/4". To create the second fold, I turned the paper to the opposite side after making the first score, and scored again at 2 1/8". The largest box, in Coastal Cabana, is 3 1/4". The next one is 3", and the smallest one is 2 1/2". My stamp camp this weekend ended up being just me and a good friend. So we sat and made cards and chatted while my kids took naps, and it was a really enjoyable afternoon! This week I'll be sharing more of my stamp camp projects. The first is a CASE from the Occasions Catalog. What does CASE stand for, you ask? Copy and share everything! I didn't look up the exact colors used for the card in the catalog, but I did pretty much copy the card. The great thing about crafting these days is that ideas are only a click away! If you never wanted to come up with your own ideas, you probably wouldn't have to. While I think it's fun to create using my own ideas, I find a lot of inspiration in the Stampin' Up! catalogs, as well as online. This card was just too pretty to change, and really quick and easy too!